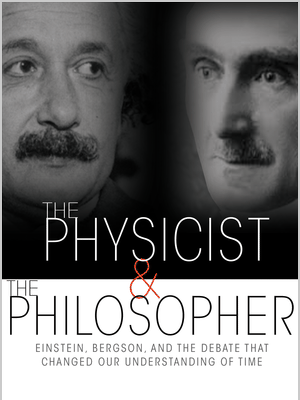 In Jimena Canales' new book, a debate betwen Einstein and Bergson asks how we really make sense of the world — through science, or philosophy? This fascinating book traces a debate about the nature of time. The debate begins on April 6, 1922, in Paris, at a meeting of the French Philosophical Society. The opinions expressed will persist and permutate into the 21st century. The first and primary debaters are Albert Einstein, a strikingly good-looking and ambitious young man, and Henri Bergson, a philosopher already distinguished and well-published. Each will develop a wide following that summons up views and arguments on behalf of one or the other. Before we get to the debate, perhaps I should state here at the outset my own limitations or biases: My training in philosophy focused on linguistic analysis. My understanding of the scientific method comes from the great American philosopher Charles Sanders Peirce. My knowledge of physics and math (the little that remains) harks back half a century. Moreover, the book I am reviewing is filled with countless details, and although they are — I’ll say it again — fascinating, it is not easy to organize them in a brief review. Einstein and Bergson were meeting for the first time. The question on the table was, What is time? Bergson was an infinitely polite gentleman with a profound affinity for art, literature, and history and a deep moral awareness that would push him, when old and ill, to brave the rain in his robe and slippers and register as a Jew on the Vichy roll, though he could have lined up powerful people to protect him in one way or another. He had already renounced all his honors and positions rather than seek exemption from anti-Semitic laws. They included the Nobel in Literature and the Grand-Croix de la Legion d’honneur. He often thought he might join the Catholic Church but he would not desert the Jews who were now at terrible risk. Einstein, a bit of a womanizer, always ready to roll (he seems to have traveled the entire world), a fan of movies and movie stars and himself something of a media hound (as was Darwin), styled himself a “theoretical physicist” and proved it with his theory of relativity. And won the Nobel Prize when he demonstrated, with his discovery of the photoelectric effect, that light is composed of quanta. 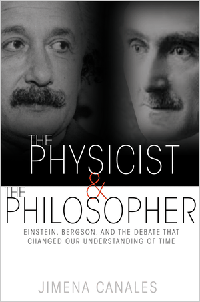 The Physicist and the Philosopher: Einstein, Bergson and the Debate that Changed Our Understanding of Time by Jìmena Canales. Available now from Princeton University Press. To those of us who have worked in academic enclaves it seems that all the available research funds go not to arts and humanities but to science. We imagine that scientists have no need to engage in backfighting. Alas, one of the things we learn from this book is that scientists fight like alley cats. Or at least quite a lot of them do. Yes, it is de rigueur to read the published articles of colleagues and to respond with questions or alternative formulations — that’s how the self-corrective system of science takes place — but who knew that scientists could line up like gangs, itching to trash this person or that? That they would badmouth one another behind their backs? That they would hold grudges? Reading this book has wised me up. At the meeting Bergson suggested that “to act on the future one needs to start by changing the past.” That might have been taken as a sleepy nostrum, sort of true or true enough but not exactly informative. From Einstein it brought forth this fierce response: “There is no time in philosophy.” What did Einstein mean by that? 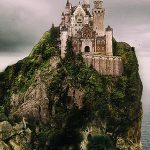 It seems that even he might not have known entirely what he meant at first, and perhaps the two had different ideas not only about time but about philosophy. At that meeting Einstein went on to talk about his theory of relativity, in which time is the fourth dimension. The poet Paul Valéry called their meeting the “grande affaire” of the twentieth century. Bergson — naturally, one would think, given his affection for creativity, for the new, and for the creative spirit — thought time an appropriate subject for philosophers to consider. Entropy rules the world but creativity resists it and continues to resist it. At the same time, Bergson, as a philosopher should, investigated the physicist’s theory of relativity and agreed with the mathematics of it. However, he argued, or added, we all have a sense of “lived time” that the math leaves out. Einstein, on the other hand, would not abide a subjective response. A felt experience of lived time could not be determined objectively. It could not be tested. And was it a sensation, or was it a judgment? Indeed, the very idea of it was an interruption in his theory, especially with respect to his l915 theory of General Relativity. 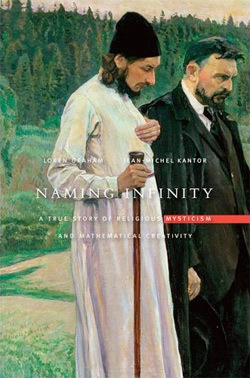 An enormous array of writers — scientists and philosophers and others — weighed in on or were cited in connection with this issue for years to come, among them Niels Bohr, Bertrand Russell, Paul Lengevin, Henri Poincaré, Marcel Proust, Ếdouard Le Roy, Edmund Husserl, Husserl’s student Martin Heidegger, Maurice Merleau-Ponty, and Sigmund Freud. And Ernst Cassirer, Walter Benjamin, Max Horkheimer, Edwin Shrödinger, Max Plank, Louis de Broglie, John Wheeler, Norbert Wiener, Richard Feynman, Suzanne Langer, Alfred North Whitehead, Willard V.O. Quine, Arthur Eddington, Gilles Deleuze. And there are more. Our author even brings in Thomas Aquinas of the 13th Century to point out that he considered theology the highest and mightiest of sciences. Einstein was the showman, Bergson, receptive and critical, the audience. Some physicists now think of Bergson as “postmodern,” although I have never encountered, even, or perhaps especially, in an English department, a clear and coherent definition of “postmodern.” Near the end of his life, Einstein found himself skeptical of some of his earlier definitions. He also found himself beset by memories. He was readier now to believe that one might have a sense of lived experience, that moments might graph not precisely a continuum but a duration, which could not be measured but only understood by intuition, which is a function of the imagination. “I cannot get it into my head,” Canales writes, quoting Einstein, that the last 30 years “make up almost 10 to the ninth seconds.” He had worked hard on behalf of Jews and if he and Bergson had been asked to talk about Jews and Nazis they would have been in complete agreement. He died in Princeton at 76. 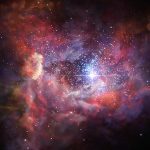 Despite noting in his travel journal on a trip by sea to Japan that “Bergson grasped the substance of relativity theory,” Einstein remained convinced that the philosopher never understood his ideas about space and time. Was it a matter of mathematics, or did he think Bergson was encroaching on the theory with imprecise notions about intuition? Bergson, on the other hand, remained convinced that Einstein never understood his ideas about consciousness and memory or the radical importance of humankind’s penchant for invention — artistic, literary, musical, scientific, arithmetic, political, financial, and any other way. I cannot help thinking that some refinement at the time of the terms applied — subjectivity/objectivity, duration/continuum, observation/measurement — would have mitigated the anxiety commentators experienced, but probably I am mistaken, given so many and such varying opinions. Meanwhile, these days, these American days, we pay far more attention to Einstein than to Bergson. We like results, we Americans. We like to know the score. But perhaps it behooves us to remember that Bergson was passionate about the necessity for free will and creativity, for that was what he was trying to guard.